Based on fossil evidence found at the Olduvai Gorge, various hominid species have occupied the area for 3 million years. Hunter-gatherers were replaced by pastoralists a few thousand years ago. 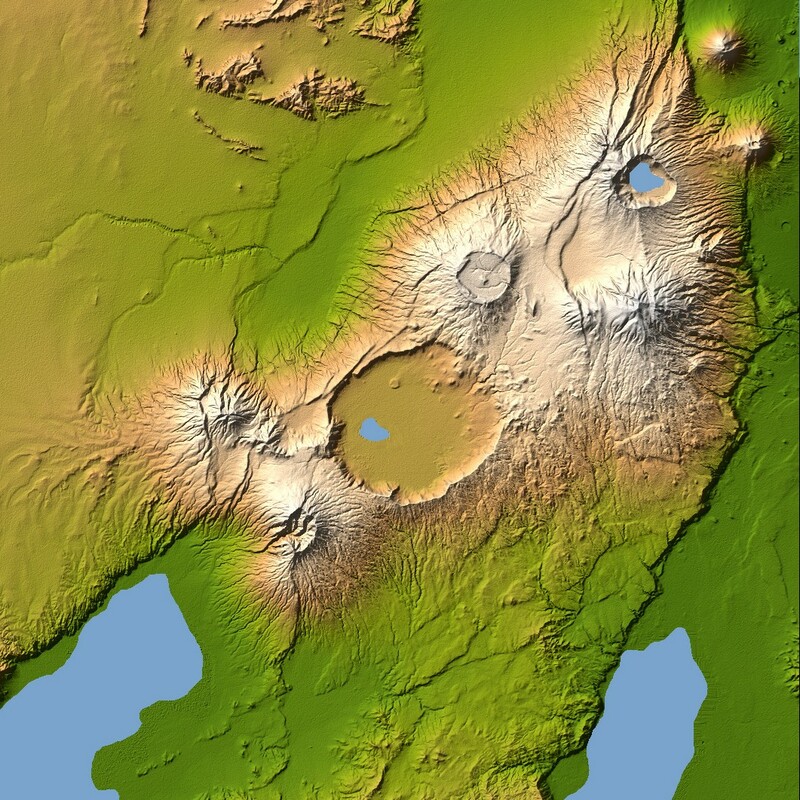 The Mbulu came to the area about 2,000 years ago and were joined by the Datooga around the year 1700. Both groups were driven from the area by the Maasai in the 1800s. Massive fig trees in the northwest of the Lerai Forest are sacred to the Maasai and the Datooga. Some of them may have been planted on the grave of a Datago leader who died in battle with the Maasai around 1840. No Europeans are known to have set foot in the Ngorongoro Crater until 1892, when it was visited by Oscar Baumann. Two German brothers (Adolph and Friedrich Siedentopf) farmed in the crater until the outbreak of World War I, after leasing the land from the administration of German East Africa. The brothers regularly organized shooting parties to entertain their German friends. They also attempted to drive the wildebeest herds out of the crater. In 1921, the first game preservation ordinance was passed, which restricted hunting to permit holders throughout Tanzania. In 1928, hunting was prohibited on all land within the crater rim, except the former Siedentopf farms. The National Park Ordinance of 1948 (implemented in 1951) created the Serengeti National Park (SNP). This, however, caused problems with the Maasai and other tribes, resulting in the NCA Ordinance (1959) that separated the NCA from the SNP. The Ngorongoro Conservation Area Authority was established by the Game Park Laws (miscellaneous amendments) Act, 1976 and owns the majority of NCA land, including the crater. The area became a UNESCO World Heritage Site in 1979. The area is part of the Serengeti ecosystem and, to the northwest, adjoins the SNP and is contiguous with the southern Serengeti plains. These plains also extend to the north into the unprotected Loliondo division and are kept open to wildlife through transhumance pastoralism practiced by the Maasai. The south and west of the area are volcanic highlands, including the famous Ngorongoro Crater and the lesser known Empakaa Crateri. The southern and eastern boundaries are approximately defined by the rim of the East African Rift wall, which also prevents animal migration in these directions. The main feature of the Ngorongoro Conservation Authority is the Ngorongoro Crater, the world’s largest inactive, intact, and unfilled volcanic caldera. The crater, which formed when a large volcano exploded and collapsed on itself two to three million years ago, is 610 metres (2,000 feet) deep and its floor covers 260 square kilometres (100 square miles). 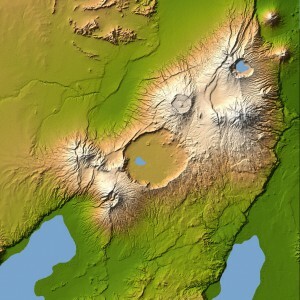 Estimates of the height of the original volcano range from 4,500 to 5,800 metres (14,800 to 19,000 feet) high. The elevation of the crater floor is 1,800 metres (5,900 feet) above sea level. The Munge Stream drains Olmoti Crater to the north, and is the main water source draining into the seasonal salt lake in the center of the crater. This lake is known by two names: Makat as the Maasai called it, meaning salt; and Magadi. The Lerai Stream drains the humid forests to the south of the Crater, and it feeds the Lerai Forest on the crater floor – when there is enough rain, the Lerai drains into Lake Magadi as well. Extraction of water by lodges and NCA headquarters reduces the amount of water entering Lerai by around 25 percent. The other major water source in the crater is the Ngoitokitok Spring, near the eastern crater wall. There is a picnic site here open to tourists and a huge swamp fed by the spring, and the area is inhabited by hippopotamus, elephants, lions, and many others. Many other small springs can be found around the crater’s floor, and these are important water supplies for the animals and local Masaai, especially during times of drought. The Olduvai Gorge or Oldupai Gorge is a steep-sided ravine in the Great Rift Valley, which stretches along eastern Africa. Olduvai is in the eastern Serengeti Plains in northern Tanzania and is about 50 kilometres (31 mi) long. It lies in the rain shadow of the Ngorongoro highlands and is the driest part of the region. The gorge is named after ‘Oldupaai’, the Maasai word for the wild sisal plant, Sansevieria ehrenbergii. It is one of the most important prehistoric sites in the world and research there has been instrumental in furthering understanding of early human evolution. Excavation work there was pioneered by Mary and Louis Leakey in the 1950s and is continued today by their family. Some believe that millions of years ago, the site was that of a large lake, the shores of which were covered with successive deposits of volcanic ash. Around 500,000 years ago seismic activity diverted a nearby stream which began to cut down into the sediments, revealing seven main layers in the walls of the gorge. Approximately 25,000 large animals, mostly ungulates, live in the crater. Large animals in the crater include the black rhinoceros (Diceros bicornis), the local population of which declined from about 108 in 1964-66 to between 11-14 in 1995, the African buffalo or Cape buffalo (Syncerus caffer), and the hippopotamus (Hippopotamus amphibius). There also are many other ungulates: the wildebeest (Connochaetes taurinus) (7,000 estimated in 1994), Burchell’s zebra (Equus burchelli) (4,000), the common eland (Taurotragus oryx), and Grant’s (Nanger granti) and Thomson’s gazelles (Eudorcas thomsonii) (3,000). Waterbucks (Kobus ellipsiprymnus) occur mainly near Lerai Forest. There are no topis (Damaliscus lunatus), oribis (Ourebia oribi), or crocodiles (Crocodylus niloticus). Impala (Aepyceros melampus) are absent because the open woodland they prefer does not exist. Giraffe also are absent, possibly because of a lack of browse species. Cheetah (Acinonyx jubatus), African wild dog (Lycaon pictus), and leopard (Panthera pardus) are rarely seen. Although thought of as “a natural enclosure” for a very wide variety of wildlife, 20 percent or more of the wildebeest and half the zebra populations vacate the crater in the wet season. Buffalo (Syncerus caffer) and eland do the opposite. Their highest numbers are during the rains. Since 1986, the crater’s wildebeest population has fallen from 14,677 to 7,250 (2003-2005). The numbers of eland and Thomson’s gazelle also have declined while the buffalo population has increased greatly, probably due to the long prevention of fire which favors high-fibrous grasses over shorter, less fibrous types. Servals (Leptailurus serval) occur widely in the crater. Lake Magadi, a large lake in the southwest of the crater, is often inhabited by thousands of mainly lesser flamingoes. The crater has one of the densest known population of lions, numbering 62 in 2001. A side effect of the crater being a natural enclosure is that the lion population is significantly inbred. This is due to the very small amount of new bloodlines that enter the local gene pool, as very few migrating male lions enter the crater from the outside. Those who do enter the crater are often prevented from contributing to the gene pool by the crater’s male lions, who expel any outside competitors. Long-term data imply that lions in the crater were struck by four deadly disease outbreaks between 1962 and 2002. Drought in 1961 and rains throughout the 1962 dry season caused a massive build-up of blood-sucking stable flies (Stomoxys calcitrans) by May 1962. They drained blood and caused painful skin sores that became infected, causing lion numbers to crash from 75-100 to 12. The population recovered to around 100 by 1975 and remained stable until 1983, when a persistent decline began. Numbers have generally remained below 60 animals since 1993, reaching a low of 29 in 1998. In 2001, 34 percent of the lion population died between January and April from a combination of tick-borne disease and canine distemper. The lion population is also influenced to some extent by the takeover of prides by incoming males, which typically kill small cubs. The biggest influence, however, appears to be disease, particularly canine distemper. The Ngorongoro Conservation Area (NCA) has a healthy resident population of most species of wildlife. The Ndutu Lake area to in the west of the NCA has particularly strong cheetah and lion populations. Common in the NCA are hartebeest (Alcelaphus buselaphus), spotted hyenas (Crocuta crocuta), and jackals. The population of African wild dog in the NCA may have declined recently. Servals occur widely on the plains to the west of the Ngorongoro Crater. The annual ungulate migration passes through the NCA, with 1.7 million wildebeest, 260,000 zebra, and 470,000 gazelles moving south into the area in December and moving north in June. This movement changes seasonally with the rains, but the migration traverses almost the entire plains in search of food.